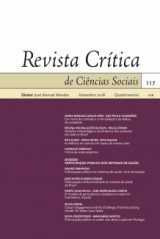 The objective of the journal is to contribute to the advancement of research on Portuguese reality, to promote reflection and discussion about the instruments of that research, and to provide information and orientation to the people that, in different ways, are connected to teaching and research in the social sciences and the humanities. This implies a permanent attention to international developments and to theoretical production at the centre, under the sign of a new cosmopolitanism capable of mediating between the local and the global while refusing the nivellating logics of hegemonic globalization. Revista Crítica privileges a transdisciplinary orientation that cuts across both the social sciences and the humanities. With this ambition, the journal defines itself as a critical journal because it affirms its resistance against the conversion of science in general, and the social sciences in particular, into an instrument of legitimation of social inequalities, and thus into an instrument of the political power that is founded in them. However, the journal extends its resistance to criticism itself whenever it falls into the mire of either dogmatism and sectarianism or naïve empiricism, or when, for any other reason, it loses sight of the complexity of the social phenomena into which science intervenes.